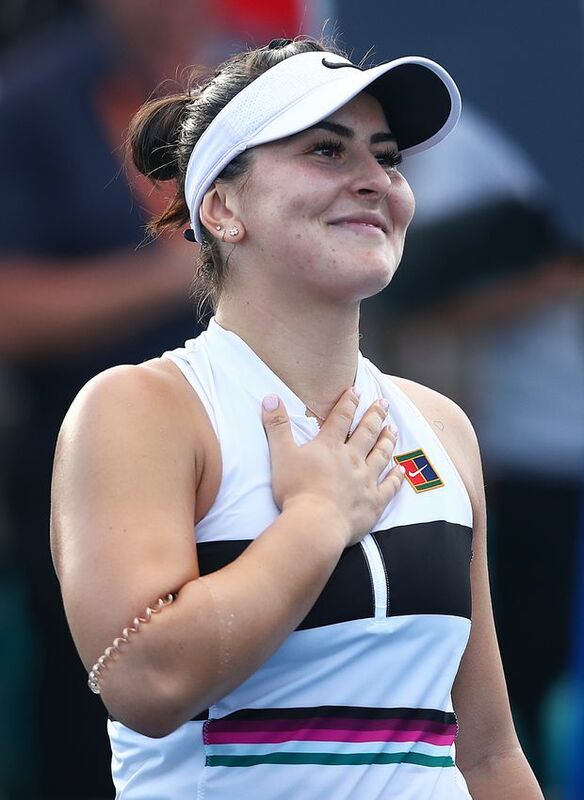 Bianca Andreescu of Canada in celebrates defeating Irina-Camelia Begu of Romania during day four of the Miami Open tennis on March 21, 2019, in Miami Gardens, Fla.
Canada’s Bianca Andreescu has exacted revenge on one of the three women to beat her in the 2019 season. Kenin was the last player to beat the 24th-ranked Andreescu, prevailing in a three-set semi-final in Acapulco, Mexico on March 1. Friday’s match lacked the drama of Andreescu’s previous three outings – all of which were three-set, two-plus-hour contests. She was coming off a thrilling win on Thursday over Romania’s Irina-Camelia Begu in which Andreescu trailed 6-3, 5-1. On the men’s side in Miami, 18-year-old Felix Auger-Aliassime of Montreal also is heading to the third round. No. 20 seed Denis Shapovalov of Richmond Hill, Ont., is slated to face Daniel Evans of Great Britain in a second-round match, likely on Saturday.